so how much for shipping to norway? I have calculated out the postage to Norway and to the United Kingdom. There will be no extra charge. The $2 shipping will cover the postage and the packing envelope. Unfortunately, I will not be able to track foreign shipments as I can with domestic shipments. Thanks allot. ill order one at once. btw where did you find that nice overview of the steering console? 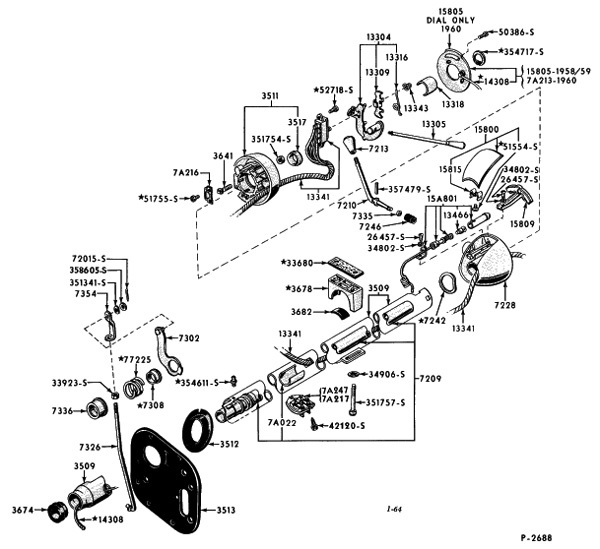 It's from the 1949-1959 Ford Illustrated Parts book. Some of the Thunderbird vendors use these lllustrations in their catalogs. I sent out the first shipment to those orders that I received by Sunday. I received a few more orders by mail today. I will send them out this week. I had wanted to put tracking on the packages, but the post office has a bizarre requirement that the package needs to be at least 3/4 inch thick to get the first class rate. If I wanted to track the packages I would need to pay $4.05 for Priorty Mail per package plus the tracking fee. You should all receive the orders within a week. The international orders were also sent out today. I received the Detent plate today. It looks great, and thanks a lot. I am glad you received it so soon. I would like to hear your experiences installing the plate and how it improves how the car stays in park. I just put the new detent plate in my 1959 Hard Top. It has never been so firmly in park! 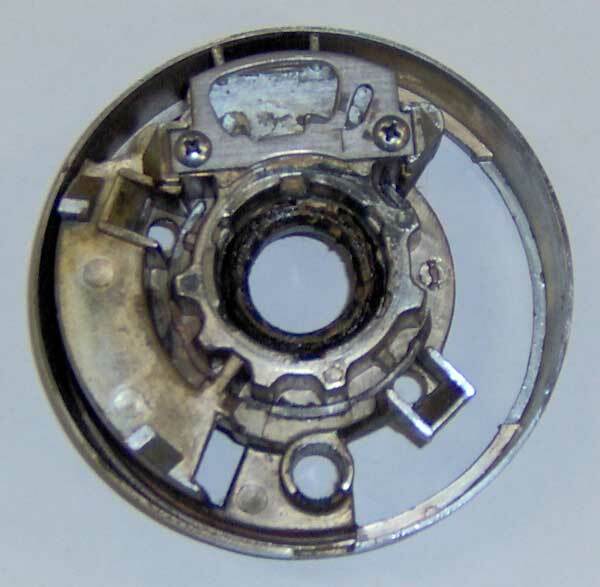 The old detent plate resembled the one on my 1960 with the wide park slot. It may have been a midyear design change. I would like to know of the variations of detent plates that you find. 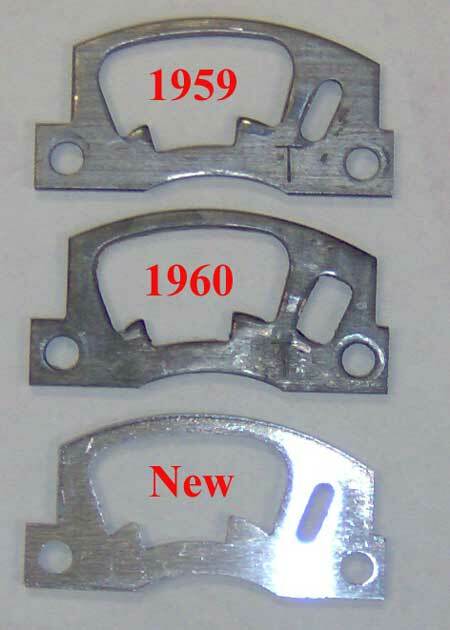 I will be making up improved detent plates for the 1961-63 Thunderbird shortly. Today, a good friend of mine had his 1962 Thunderbird pop out of park and into reverse. The car went through his garage door. My car should be coming back from the paint shop in a couple of weeks, and then I will be putting in the new dash pad. I know the wheel has to come off so that will be a good time to install the detent plate. I'll let you know how that turns out. Installed my new plate yesterday and that lever now LOCKS into park - it's GREAT! It actually "clicks" into place. Everything went together just perfectly. My '60 had the typical '60 design with the wider oval. I don't know why Ford decided to change that detail - the narrower oval seems more secure. You must have it posted somewhere - I just haven't stumbled across it - how much??? To zip code 81212. BTW, I see a listing on e-Bay for this item and the graphics look SUSPICIOUSLY like they were taken from your site! Or, maybe it's YOU selling them on e-Bay??? You can order them here: http://www.squarebirds.org/detent_thunderbird.htm . There are a few more plates remaining. Orders received by PayPal or postmarked by April 28, 2006 will be remain $20 each, plus the PayPal surcharge and $2 shipping to anywhere in the continental USA. Orders after that will be $25 each. I got mine yesterday in the mail and it looks great. One went for 54 bucks on ebay yesterday.